Okay, so this is pretty obvious but is still extremely fun to do. I have done this many times during the month of June because it keeps the kids focussed. Sometimes I even tell the kids that it is not going to be formally assessed but the expectations still need to be met. The basic concept is that the students work in partners and create a game that is probability based. This automatically rules out many games that are skill based (throwing darts or basketball tosses) unless they can prove its probability based. Next the students brainstorm ideas from games they have already seen from fairs and generate their own ideas. I almost always make students generate their own ideas and proposals before I put them in partners or groups. They have to come to the table with something or they work alone. (This creates accountability and those students who just can't complete assignments and now won't be another student's problem but I can work with them in a smaller group with other similar students). While they come up with their game concept, I begin teaching probability of single and two events. The criteria I give them has them create a game where they have a minor prize and a major prize. I usually give them a general rule of minor prize should be around 1 in 5 and a major prize around 1 in 20. This gives them a sense of how they need to create the game. Many games have 2 stages (or events like a plinko board they may have to hit the winner twice for a major once for a minor) while others just make one event with different options (for example the classic choose a rubber duck from the pond. only 1 of the 20 is major while 4 have minor). The figure out the theoretical probability of their game and build it. It helps to have many decks of cards and lots of dice around because students use them. The creativity of the games can be quite amazing just as much as it can be underwhelming. I have had the students bring in prized that they will give away, or I have collected money and bought the prizes myself so that all prizes are equal (therefore people don't choose a game to get a better prize), or one year I had some PAC money that I was allowed to spend and put it towards the prizes. The next stage is interesting too because I get the students to perform the games for the school. 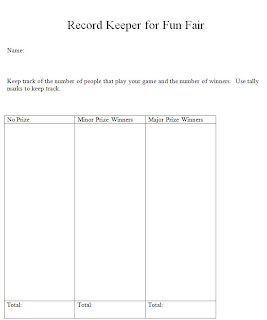 During this time they not only host their game but they must keep a data sheet on the distribution of prizes , number of contestants and those who won nothing. We keep track of this as our experimental probability and it gives us a chance to compare to our theoretical probability. It also allowed me to speak with kids about preventing cheating on games and how to make their probability true. 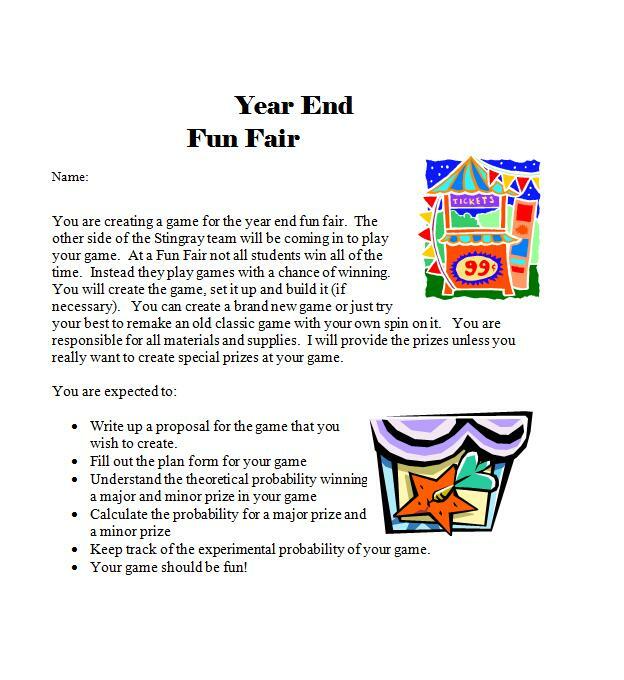 The students learn pretty quickly if their theoretical probability is correct or if they missed something because I have them report their major prizes and their game will be shut down if it is paying out too much (kind of like a slot machine that has been paying out too much). If they can prove to me that they have fixed it; I will allow them to start the game back up. have as many other teachers help you supervise as well. allow for creativity and allow them to make mistakes so that they can understand the difference between experimental and theoretical. Here is the criteria that you can copy and paste! Please comment if you use this! It would be great to hear from people and see what they are doing. 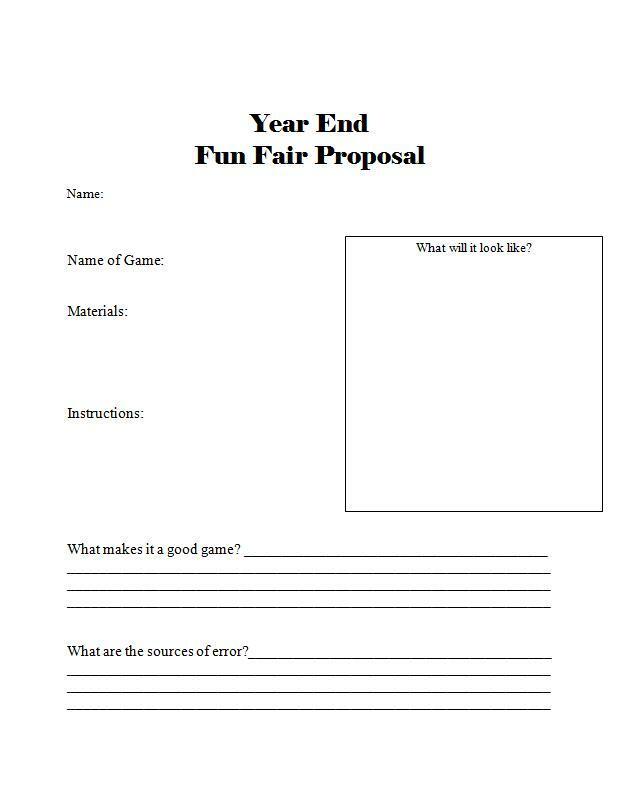 You are creating a game for the year end fun fair. The other side of the Stingray team will be coming in to play your game. 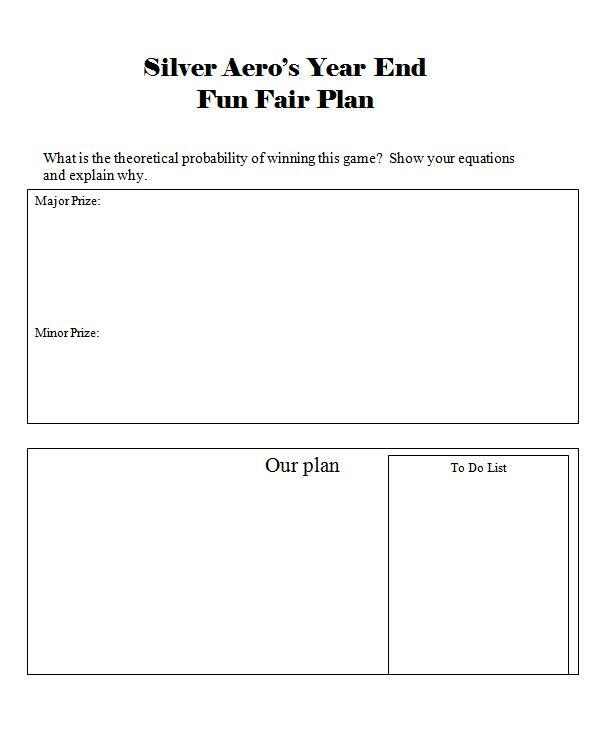 At a Fun Fair not all students win all of the time. Instead they play games with a chance of winning. You will create the game, set it up and build it (if necessary). You can create a brand new game or just try your best to remake an old classic game with your own spin on it. You are responsible for all materials and supplies. 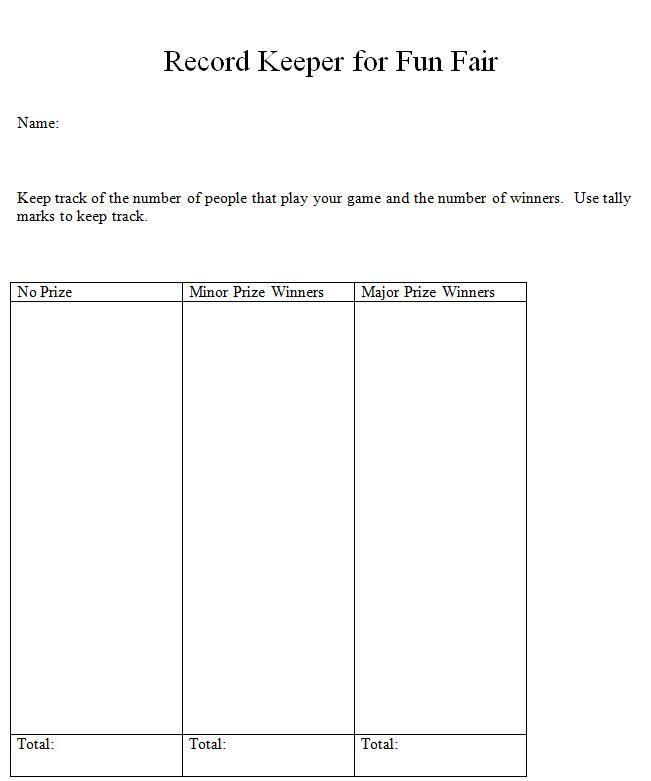 I will provide the prizes unless you really want to create special prizes at your game. · Write up a proposal for the game that you wish to create. 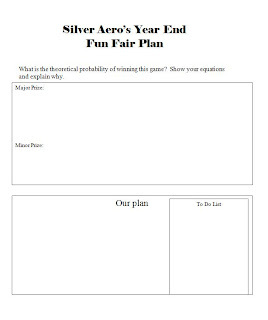 · Keep track of the experimental probability of your game. 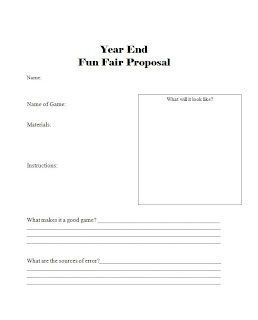 · Your game should be fun!